Q. I have a raised-bed garden in Florida, and recently found a bug feeding on the leaves of my Zinnia plants at night. The bug is about a quarter to a half inch long and I think it may also be harming my basil and bean plants. I was wondering if you could help me identify this pest and if there is a way to get rid of it organically. A. Well at first, the photo she sent and the 'feeding at night' observation made me feel certain that it was the Asiatic beetle—a night-flying cousin of the infamous Japanese beetle. But when I started to freshen up my research—we last reported on the Asiatic beetle way back in 2010—all the articles specified that this was a pest of the Northeast: Vermont, New Hampshire, Ohio…which was frustrating, because there's a great new way to control these and other destructive beetles I've been dying to talk more about. And we do seem to be talking about it; so what changed? I got crazy specific, searched "Asiatic beetles in Florida" and found a 2013 Bulletin from the University of Florida announcing the first confirmed captures of the beast in their state the year before. (They note that they had expected to find them down there much sooner.) To make things even more interesting, the reported captures were in Jacksonville, at the very top of the state; while Illyce's garden in Hollywood is in the far Southern tip—so I think it's safe to assume that they're all over Florida at this point. To review: The Asiatic beetle is a scarab beetle, as are rose chafers, June beetles and Japanese beetles. 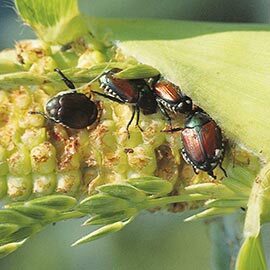 Like the Japanese beetle, the Asiatic is a pest in both the adult and larval stage; the adults chew on plants and the grubs eat plant roots underground. It attacks hundreds of different types of plants but isn't considered to be as destructive as the Japanese beetle (which is not much of a compliment). And it's nocturnal. Both Illyse in Florida and the listener (in Great Falls, Virginia) who first brought the topic to our attention back in 2010 went out after dark to catch it in the act. Now, although they fly by night, they're attracted to light—something you can use to your advantage in two ways. 2)	Use a bright light to make a trap somewhere on the outskirts of your property. 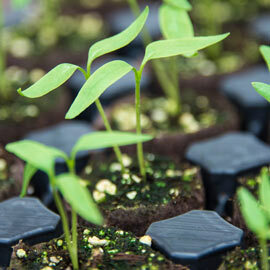 (As with Japanese beetle traps, don't place it near the plants you want to protect. )You can hang sticky traps underneath; or use Japanese beetle traps--and maybe bait them with a special lure that's sold to attract oriental beetles to see if that helps with your catch. If you're having a lot of damage—or had bad damage the year before and your garden is in the North—consider releasing beneficial nematodes as soon as the soil is warm in the Spring and/or about a month after the adults have disappeared in late summer. These microscopic good guys will burrow down into the soil and attack these and any other grubs feeding on plant roots. 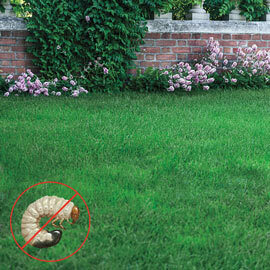 Beneficial nematodes are great—they prey on grubs (and flea larvae), but don't hurt earthworms or other good creatures. And now for the new weapon I've been teasing! Now, this would seem to be the first strain of Bt to work against multiple targets—I mean we're talking grubs, beetles, weevils, and even some wood boring insects! But it's not, because they're all technically 'beetles'. And as with that old original, the target insect has to eat the sprayed leaves (or in the case of beetle grubs, drenched roots) to be effective. None of the Bts has any effect on birds, bees, frogs, toads, people or pets. All of the Bts are very pest specific and thus environmentally friendly. In fact they're probably the safest "weapons" in the organic gardening arsenal.